It is always interesting to see Polish culture through foreigners’ eyes, so when the Krakow Post was contacted by a US company offering culinary holidays in Poland, I was intrigued. Run by Małgorzata Rose, a Pole who emigrated to the US many years ago, her travel company takes visitors on guided culinary tours of different regions of Poland. I joined her and three of her guests for a couple of days on a tour she had organised in Małopolska. Before I joined them, the itinerary seemed to be packed solid (i.e. not my kind of holiday) but it covered all the important aspects, as well as a few things that were new to me. First stop was the Pierogi Festival. When I first heard that this was on the itinerary, I have to admit my heart sank. The memory of the rather underwhelming ‘Lato Leniwców’ (Sloth’s Summer) the previous weekend was still fresh in my mind and the Clevelanders in the group were no strangers to pierogi, thanks to the generations of Polish immigrants who have settled there. However, the Pierogi Festival didn’t disappoint. It was well organised and every exhibitor seemed to be taking the competition for the best pierogi and the trophy seriously. Małgorzata went the extra mile and set up a meeting with the organisers of the festival, who explained that this was the ninth edition and that it was going from strength to strength, with an estimated 240,000 pierogi due to be consumed. The group then headed off to Zakopane and the mountains, where they were kept busy (and well fed) with white water rafting, visiting a mountain hut to see shepherds make Oscypek, a morning spent cooking with a group of women from the village of Łopuszna, visiting the market at Nowy Targ and eating out in Zakopane’s best restaurants. I rejoined the group a few days later back at the Culinary Institute in Cracow. No, I hadn’t heard of it either. Probably because it’s not really in Krakow but in a village on the outskirts. The CIC has a purpose-built, professional catering kitchen and runs regular courses for cooks on a variety of culinary topics, ranging from traditional Polish food, to Italian, fish and seafood, pastry, desserts and even molecular gastronomy. 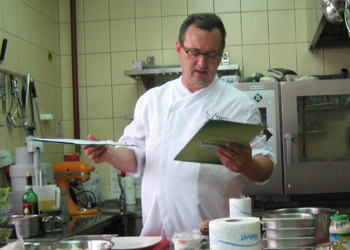 The owner, Marek Widomski, is an experienced chef who trained at the Pierre Dubrulle French Culinary School in Vancouver where he also worked before returning to Poland 11 years ago. It was an sobering experience watching him single-handedly prepare herrings and vegetable salad, pierogi (three types of fillings), żurek (sour rye soup), gołąbki (stuffed cabbage rolls) and bigos all in the space of two hours – and still have time to pour us vodka, serve food, talk us through the recipes and pop outside for a cigarette. I thought I was an organised cook, but I now realise I have a way go. As he worked, Marek also told us about the courses he has set up for cooks working in local schools, mainly women in their 40s and 50s who have been doing the same job for years with few complaints. Many of them are facing an uncertain future as local authorities are starting to demand formal qualifications. Now they can come to the CIC for a tailored course and leave with a certificate and a more secure future. For me, this was an inspiring story with which to leave the tour. This is also a good point for me to say ‘goodbye’– this is my last Fork Out. It’s been a lot of fun writing this column but I now have a number of other projects vying for my time (you’ll read about them in the Krakow Post soon) so I’ve decided to hang up my tasting fork. Thank you for reading and happy eating (real food wherever possible)!